Grossman (HGL) are well known for supplying toys that are slightly different from typical mainstream collections... and their brand new Deadstone Valley range is no exception. Defintely not for the squeamish, Deadstone Valley is all about creating corpses and burying them online. As well as a range of figurines, kids can log on to a website to create their own characters complete with tombstone. They can then "bury" them with their own unique epitaph. 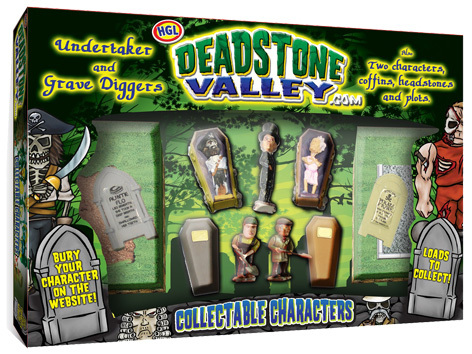 With many figures to collect, kids can have ghoulish fun amassing a complete collection of Deadstone Valley bodies. The range launched at Toy Fair in January 2012 and an extended range was unveiled at the 2013 fair. Grossman hopes to create the largest cemetery in the world. Grisly fun it may be, but the company have been keen to point out that considerable market research showed that kids would love the concept. Please tell us what you think of Deadstone Valley by HGL.